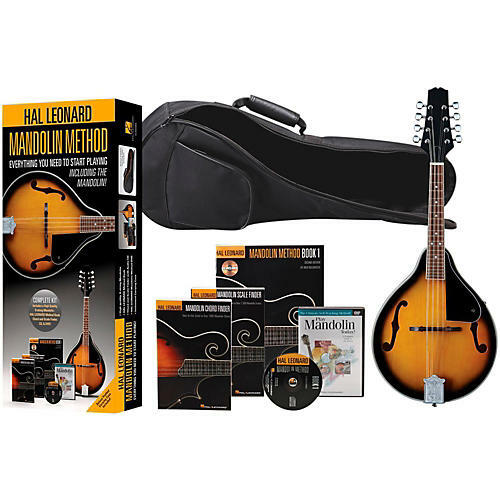 This pack includes everything you need to play the mandolin today. The high-quality mandolin is ready to pull out and play. It is finely constructed with quality tuners and a level playing bridge, making it an ideal instrument to learn on. The pack also contains a padded case and a comprehensive, easy-to-use beginner's book/CD that features many songs to play while you learn. The book includes information on tuning, reading music, melody playing, strumming, and scales, and the CD is comprised of demonstration and play-along tracks. The pack also includes scale and chord books, along with a DVD featuring on-screen musical examples and demonstrations to really hammer home everything you're learning in the book. Whether you're teaching yourself or a classroom of students, this pack will get the job done.